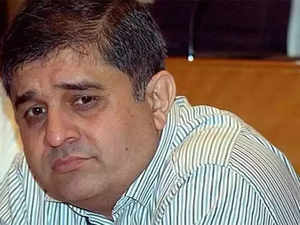 Amitabh Chaudhry, as the chief executive of Axis BankNSE -0.77 %, is yet to deliver his first quarterly earnings. But the stock is up 25% since he chose banking over insurance. Such investor trust in one’s leadership is a dream start, but it can be as much a burden when it comes to meeting expectations. Change is writ all over. From priorities, to new management team, and to the dos and don’ts –– all are new to a bank that moved from being a conservative lender to an aggressive financial conglomerate focused on growth under Shikha Sharma for nearly a decade. Chaudhry, a former insurer, is bringing in the conservatism he acquired in his previous avatar as the chief of HDFC Life, and at the same time is not taking his eyes off financial metrics an investor is keen on – return ratios. Targets are set. Deliver a return on equity of 18% on a sustainable basis, up from the 7.3% in December 2018. A conservative provisioning policy that can depress profits now, but comforts investors. No more infrastructure and project funding. Raise share of working capital loans to industry average of 60% from 35% now. And in retail, reduce the mortgages where returns are getting squeezed. What does an investor think? Many managers carry the continuity mantra for the organisation to keep going without disturbing the existing structure. But Chaudhry is different. He’s turning Axis Bank on its head. Its management structure is undergoing a transformation that’s completely the opposite of what it was under Sharma. The operations are split in such a way that origination, risk and monitoring are under different heads. Almost every department head – at least 8 as compared with just 4 earlier – directly reports to the CEO. That includes the technology head and the risk manager. A vital hire in the entire set-up is 64-year-old Deepak Maheshwari, a banker who cut his teeth at State Bank of India, and was later the backbone at HDFC BankNSE -0.09 %. While Axis Bank grew in size and stature with it becoming a takeover target, the economic slowdown and its infrastructure exposure hurt it severely. Its bad loans surged to 6.77% in FY18, from 1.13% in FY10. Its provisioning was at Rs 15,519 crore last fiscal, something that also drew the regulator’s ire and forced it to classify more like many other banks. Although the bank suffered like many other state-run banks and peer ICICI Bank, it managed to raise equity capital of ?11,626 crore from buyout firm Bain Capital, navigating the crisis. When Sharma, an ICICI banker, became the CEO in 2009, she dreamt of turning Axis into India’s JPMorgan, an idea that grew in her during her deputation at the US bank when it had a securities and investment banking joint venture with ICICI. An early sign of the direction an institution is set to take would be reflected in the top level hiring. Sharma hired V Srinivasan, a JPMorgan hand, as her deputy. In Chaudhry’s case, there are many from HDFC Bank. 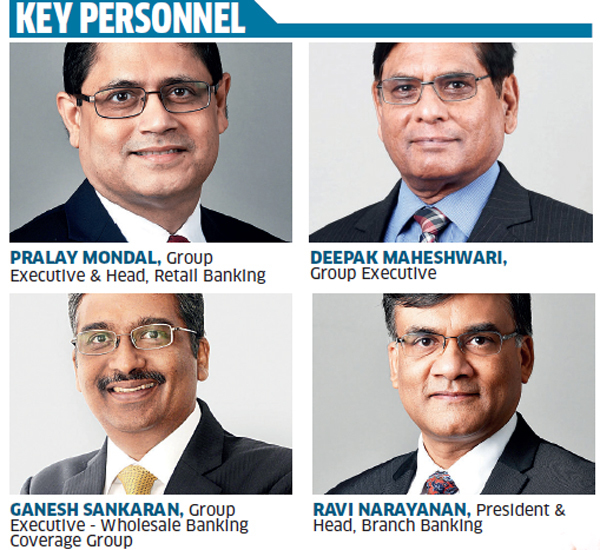 There are at least four top hires with HDFC Bank background, including Maheshwari.Ravi Narayanan,the head of branch banking, V Ganesan Would lead corporate banking,and pralay Mondal, who comes from Yes Bank to head reatail lending,also worked for HDFC Bank. Is Axis Bank the next HDFC Bank? There’s a thrust on changing the processes. The chief credit officer will report to the CEO. There would be a coverage team that would focus on customer relationship, and own the credit process by writing different offers. The underwriting would be approved by the chief credit officer’s team. Heads of these separate teams would report to him. “So, that’s the challenge — how does Axis Bank transform processes without putting a brake on new business acquisition? What are the elements that need minor tweaks versus major re-engineering — how quickly can the team assembled by Amitabh identify and address these?” asked ASV Krishnan, lead analyst, banking and financial services at SBICap Securities. The missing piece was an investment banking business where deal making brought in clients as well as earned more fee income. In a bold move at that time, Sharma had acquired Enam Securities for Rs 2,067 crore, a shopping decision that drew a lot of criticism. But it subsequently paid off. Chaudhry believes that transformation of Axis into a financial supermarket is incomplete. The missing link is insurance. That is a business that he knows like the back of his hand after bringing HDFC Life to the 2nd position, from No. 4 when he was appointed CEO. Axis is already the biggest distributor of insurance policies of Max Life. The banking channel contributes more than half the revenues of the Delhi-based insurer and has a 2% stake in it. Chaudhry knows its business quite well as he attempted to take over the firm when he headed HDFC Life. To be sure, Chaudhry has inherited a bank that was on the mend even before he took over. Axis’ credit costs, for example, have fallen from a peak of 3.57% at the start of the current fiscal to 2.17% in December 2018, closer to the long-term average of 1.10%. Although surging bad loans and the regulator’s denial of a full term to Sharma hurt the public perception of Axis, the franchise was solid with an enviable 46% of funds in low-cost deposits. The bank has an enviable business. In the last decade, it grew its CASA deposits and branch network four times. Its operating profit is up five times and it has businesses in fast growing areas like digital, something made possible with the acquisition of Freecharge. It has a non-banking finance company, a digital retail trading platform in Axis Direct, and Treds which is an exchange that trades in receivables. All these make it a target for predators. Kotak Mahindra Bank was reportedly eyeing Axis as an acquisition. If Chaudhry does better, it could only make Axis more attractive for a predator. How does he handle it? At Axis, almost everything appears to have changed, except the food menu.